Woke up early well rested, the bed I slept in for the night was just perfect, gave me the rest I needed. I made myself some eggs for breakfast and was on the road by 7:30. Setting out at 7:30 on Sunday, August 30, there were not many people around. I cycled up along the Welland canal, my plan was to cross over the Welland canal at Niagara Regional Road 81 – when I got there the bridge was up as a big ship was passing through. I stayed there for a while, tills I learned that after the ship passed there was another ship going the opposite direction. So I cycled up to lock 3 which has a viewing center of Welland Canal. 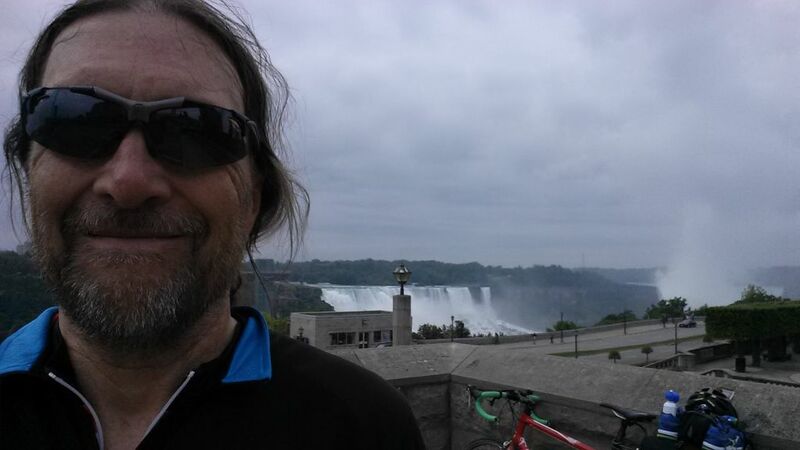 I continued and crossed over the Welland canal on Niagara Regional Road 89, I continued on tills I reached Niagara Falls. I took a look at the Canadian side of the falls, such an amazing view. I crossed into the United States using the Rainbow Bridge, on the bike you are treated as a vehicle so you can not take the pedestrian walkway over. So time your crossing to a time when it is less traffic, as you have to wait in line as any vehicle. At the USA Border Check – I had two cars in front of me, when it came to my turn the process was very easy and quick, I had all my papers in place showed it to the customs official. The papers I showed was the passport, phone number, and address to where I was going, the air ticket when I was leaving USA. As I had a long ride in front of me, I took a look at the falls from the USA side, I have always been on the Canadian side when I been at the falls as I used to live in Toronto. The USA side of the falls is very nice. I then headed towards Lockport were I was going to join the Erie Canal Bike trail which I plan to follow all the way to Rochester. I got to Lockport before noon, on time accordingly to my schedule – I had a look a the Lockport locks, it is an amazing feat of engineering, worth the visit. I got onto the trail towards Rochester, the day turn out to be a hot one, by the time I got to Middleport it was already over 30 Celsius, I took a break to eat and drink and refill my bike bottles. I continued on and eventually at 17:00 I reached Rochester. I was staying in Rochester for the night, so I got into to town following the trail and got to a trail junction where Erie Canal meet with Geneses River. I was tired and not very alert after a hot day on the bike, at the trail junction I was not sure were to go to find the place that I was going to stay at, so I bike over the Erie Canal into Rochester – that is when I took a wrong turn, so I had to ask my way around, no one that I asked knew exactly where the address was located in Rochester, eventually I saw a police car half hidden on a parking lot that was sitting there with a radar gun to catch speeding cars. I approach with a distance, I called out to ask if I could approach as I wanted to ask for an address, the policewomen in the car said sure I help, and she gave me the direction that I had to go, it was not that far, in another town called Brighton. While biking in the direction of the overnight place, the police car came speeding past me with sirens on and just down the road pulling a car over, when I came upon the police car the policewomen walk back to her car and gave me a thumbs up. I knew I was heading in the right direction. I came up on the house that I had booked a room on from Airbnb, lovely house and the room I stayed in was large with a large queen bed. My day was over.